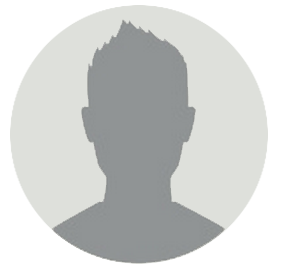 A hazard, if exists, in a digital circuit causes a temporary fluctuation in output of the circuit. In other words, a hazard in a digital circuit is a temporary disturbance in ideal operation of the circuit which if given some time, gets resolved itself. 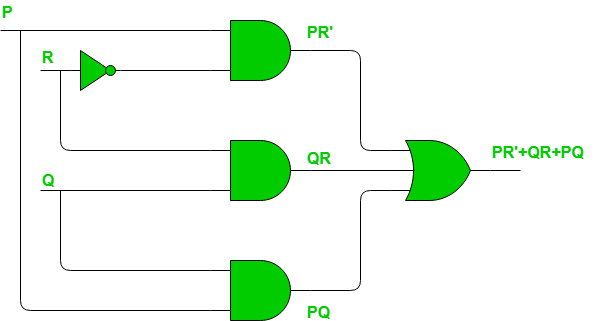 These disturbances or fluctuations occur when different paths from the input to output have different delays and due to this fact, changes in input variables do not change the output instantly but do appear at output after a small delay caused by the circuit building elements, i.e., logic gates. We will discuss only static hazards here to understand it completely. 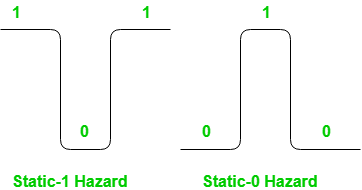 Static-1 Hazard: If the output is currently at logic state 1 and after the input changes its state, the output momentarily changes to 0 before settling on 1, then it is a Static-1 hazard. Static-0 Hazard: If the output is currently at logic state 0 and after the input changes its state, the output momentarily changes to 1 before settling on 0, then it is a Static-0 hazard. Step-1: Write down the output of the digital circuit, say Y.
Step-2: Draw the K-map for this function Y and note all adjacent 1’s. Step-3: If there exists any pair of cells with 1’s which do not occur to be in the same group ( i.e. prime implicant), it indicates the presence of a static-1 hazard. Each such pair is a static-1 hazard. Example – Consider the circuit shown below. The pair of 1’s encircled as green are not part of the grouping/pairing provided by the output of this Boolean function. This will cause a static-1 hazard in this circuit. Note that there is no difference in number of minterms of this function. 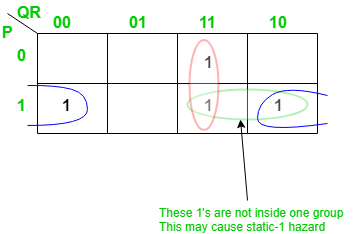 The reason is that the static-1 hazards are based on how we group 1’s (or 0’s for static-0 hazard) for a given set of 1’s in K-map. Thus it does not make any difference in number of 1’s in K-map. The circuit would look like as shown below with the change made for removal of static-1 hazard. Similarly for Static-0 Hazards we need to consider 0’s instead of 1’s and if any adjacent 0’s in K-map are not grouped into same group that may cause a static-0 hazard. The method to detect and resolve the static-0 hazard is completely same as the one we followed for static-1 hazard except that instead of SOP, POS will be used as we are dealing with 0’s in this case.